Your venue website can be the most important marketing source for your business, more important than social media, PR review or even promoters, Generate pure revenue, own your customer's contacts and data. 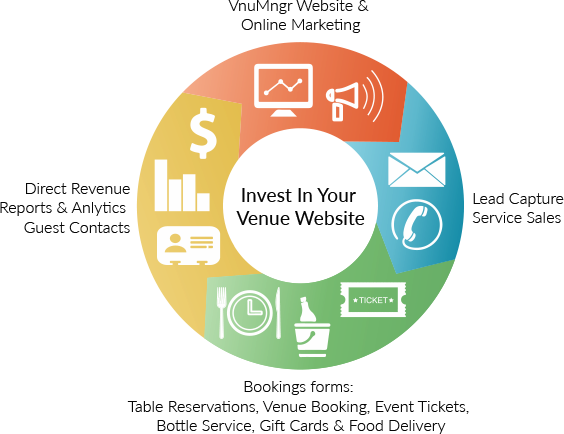 With VnuMngr eco-system you will turn your venue website into a Marketing & Sales Machine with back-office management tools that cover all your booking data, marketing & online sales from one software. We offer a new business practice that can guarantee an increase in revenue & exposure in a short time, A 360* marketing campaign with execution tools that help you attract new clients & help you convert inquiries to actual sales instantly.